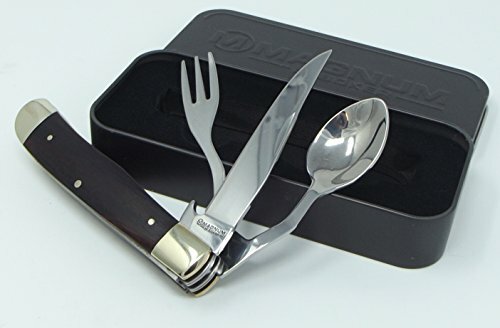 Eat in style with this genuine stag handled knife and fork set with convenient leather belt sheath. This set is designed to be used on-the-go for hikers and hunters that don't want to leave all the comforts of civilization behind. With these stainless steel eating utensils it is easy to stay on the trail of your prey. The Leather belt sheath ensures that these won't get dirty sitting at the bottom of your bag, and stay ready for you when you need them. Each has an overall length of 7 7/8 in. Limited lifetime warranty. A chestnut tree is the world famous trademark of the Boker knife manufactory in Solingen, Germany. It represents innovative, high quality, exceptional knives, manufactured with pride, by hand, for over 145 years. 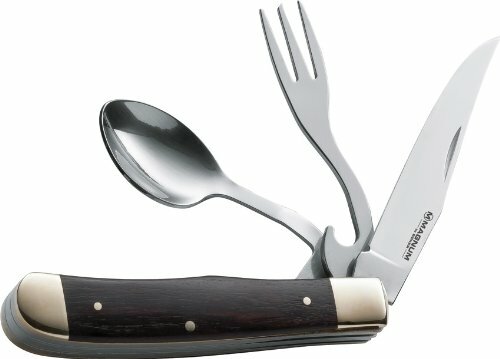 The Boker Plus 03BO800 Snac Pac Cutlery Set is back by popular demand! The SnacPac Travel Set tucks into lunch box, backpack, or glove compartment for instant mealtime convenience. This unique design is so handy, it's patented! The SnacPac combines a spoon, stainless steel fork and knife, and salt and pepper shakers- all in one handy little package. The durable ABS plastic case prevents the fork from poking through your lunch bag, and keeps the utensils clean. Completely dishwasher-safe, too! Ideal for camping, fishing, hiking, picnicking, travel, office or a lunch on the go. Overall length: 8 ½ in. Weight: 3 oz. This Boker Plus knife isn’t just for cutting, it’s for leaving a mark. Limited lifetime warranty. A chestnut tree is the world famous trademark of the Boker knife manufactory in Solingen, Germany. It represents innovative, high quality, exceptional knives, manufactured with pride, by hand, for over 145 years. 4.13" closed. Stainless clip, fork, and spoon blades. Black wood handle. Stainless bolster(s). Inlay shield. Innovative locking mechanism allows you to operate each tool individually. Gift tin. The Boker Magnum 01LL209 Bon Appetite Pocket Knives are a complete and compact set of utensils, perfect for camping, hiking, or a snack on the go. The knife, fork and spoon are made of 440 stainless steel, and the innovative locking mechanism allows you to operate each tool individually. The black wood handle adds a classic look. Blade length: 3 3/8 in. Overall length: 7 3/8 in. Weight: 2 oz. This Boker Magnum knife isn’t just for cutting, it’s for leaving a mark. Limited lifetime warranty. A chestnut tree is the world famous trademark of the Boker knife manufactory in Solingen, Germany. It represents innovative, high quality, exceptional knives, manufactured with pride, by hand, for over 145 years. 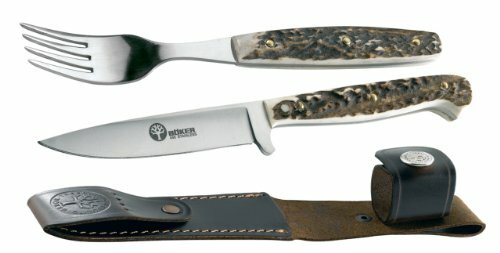 The Boker Magnum 01MM009 Filmam Canivete Com Garfo Folding Knife is a handy picnic knife, or a stylish all-around tool. 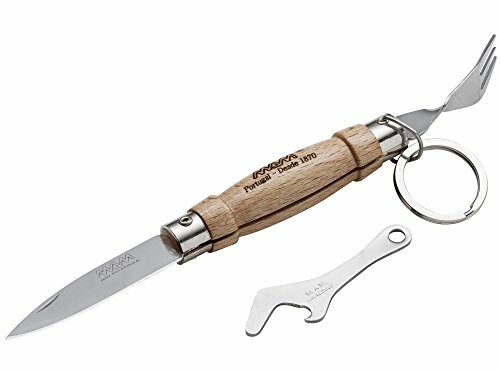 The Canivete Com Garfo (pocket knife with fork and bottle opener) makes easy work of a meal on the go. Friction folder (does not lock). Blade length: 2 ½ in. Overall length: 5 ½ in. Weight: 1.2 oz. This Boker Magnum knife isn’t just for cutting, it’s for leaving a mark. Limited lifetime warranty. A chestnut tree is the world famous trademark of the Boker knife manufactory in Solingen, Germany. It represents innovative, high quality, exceptional knives, manufactured with pride, by hand, for over 145 years. The SnacPac Travel Set tucks into lunch box, backpack, or glove compartment for instant meal-time convenience. This unique design is so handy, it's patented. The SnacPac combines a spoon, stainless steel fork and knife, and salt and pepper shakers - all in one handy little package. The durable ABS plastic case prevents the fork from poking through your lunch bag, and keeps the utensils clean. Completely dishwasher-safe, too. Ideal for camping, fishing, hiking, picnicking, travel, office, or a lunch on the go. Specifications:- Overall Length: 8 1/2"- Weight: 3.0 oz. 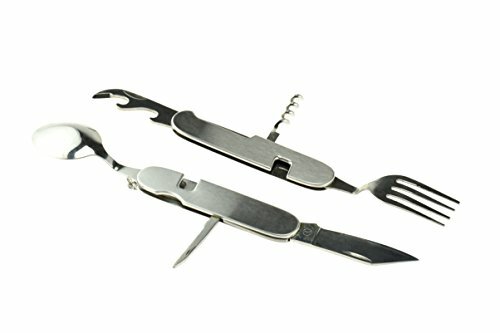 Whether you are camping or simply working on projects, this high-quality multifunctional camping tool is entirely constructed of stainless steel for long-lasting durability. The tool can detach into two separate units so the eating utensils may be used simultaneously as needed, and easily snaps back together for compact storage and organization. 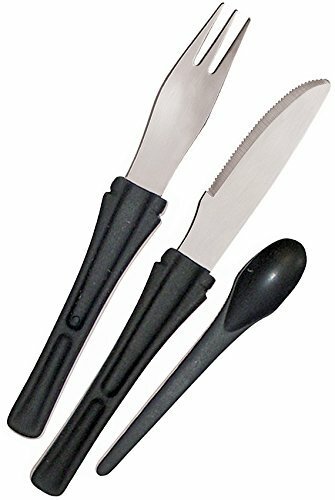 Features of this product include: • (7) Functions: 1 – Fork 2 – Spoon 3 – 2-¾” Knife blade 4 – Can opener 5 – Bottle opener 6 – Cork screw 7 – Tent reamer • Quality, durable stainless steel • Detachable into two separate units: - Spoon/knife unit - Fork unit - Designed for the need to use both units simultaneously • Foldable into a compact pocket size • Nylon carrying pouch with belt loop Important: Avoid getting counterfeit items. Genuine SE products come with our SE logo on the packaging. SE is committed to providing the customer with the best possible source for value. You will enjoy the quality, function and usefulness our 7-IN-1 Multifunctional Camping Tool has to offer. SE is a registered trademark protected by US Trademark Law. Looking for more Boker Fork similar ideas? Try to explore these searches: 200sx Suspension, La Costena Sliced Jalapenos, and Antique Cubic Zirconia Earrings. Look at latest related video about Boker Fork. Shopwizion.com is the smartest way for online shopping: compare prices of leading online shops for best deals around the web. Don't miss TOP Boker Fork deals, updated daily.